I had another post planned, then the above picture happened…. 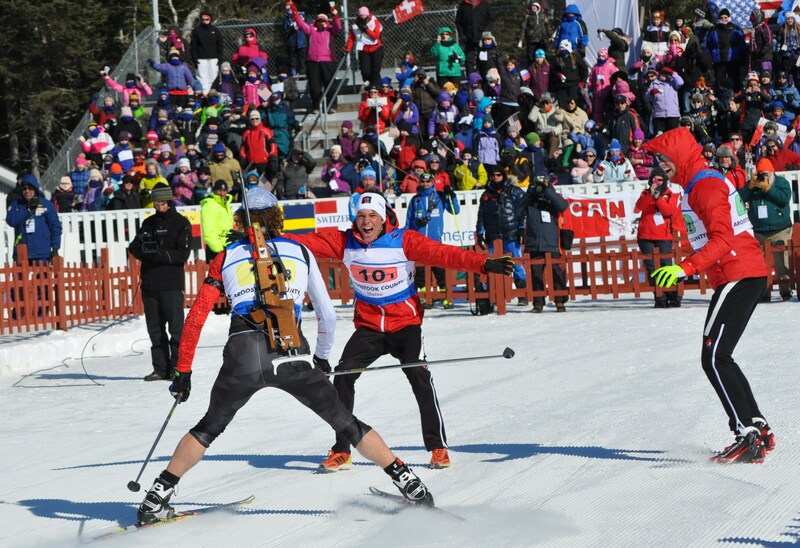 The guy with the huge smile on his face is greeting one of his team mates at the finish line of world Championships. They have just won a silver medal in the relay, a huge feat considering the competition! 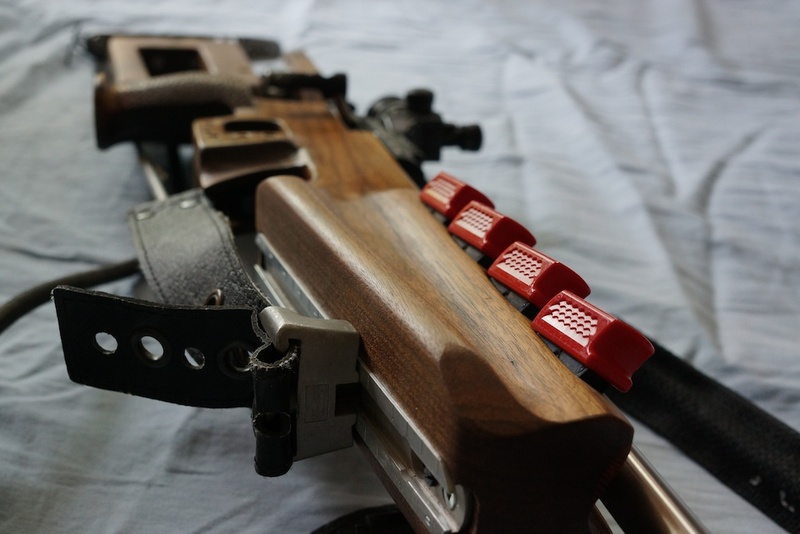 He raced using one of my custom rifle stocks, the design was a collaboration between what he liked and what I felt was best for him. Very excited for him and his team mates, they really deserved this win after a long season of hard work! Alex also had a 5th place individual finish earlier in the week shooting 17/20, his best International result to date! Here is a link to the post about his stock. 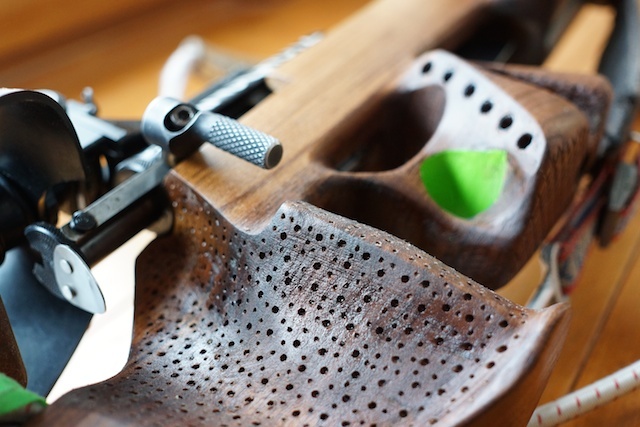 While I said last post that I was cleaning the shop and setting up some new to me tools, I ended up finishing one last project… It was quite the year for custom rifle stocks! I’ve made many over the last few years, but 8 in one year is a new record for sure. This one was for another local athlete. It’s made from Walnut and has some green accents (as per the athlete’s request). On this one I ended up making all the adjustable parts as well, which takes a bit of extra time but ends up working out nicer in the end. 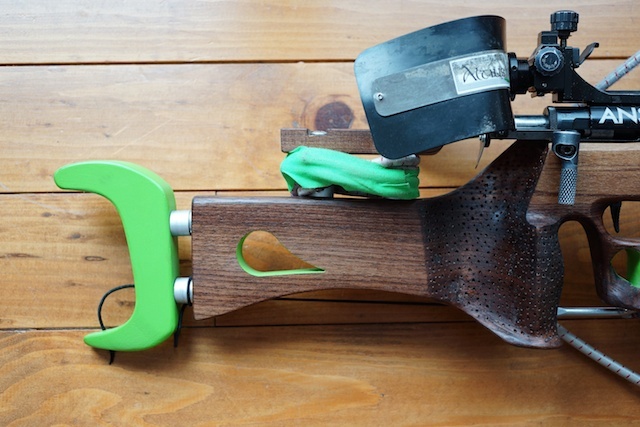 The finish on this stock is boiled linseed oil, it’s cheap, easy, and looks great. The other 7 I did this year have all been exposed to some harsh weather and still look like the day they left my workshop. I doubt 2014 will bring quite as many stock requests, which is fine, I wouldn’t mind spending time on some other projects I have in my head. All the cut offs from this stock (and my other stocks) get used in many of the items for sale in my Etsy Shop. Cutsom stock #2 is now finished and off to a happy customer. This one was also made of walnut but had a slightly different design as requested by the client. Once again I’m really happy with the finish on these rifles and will use it more often on my other work. Finally something to post about… Or more like finally some time to post what I’ve been working on…. 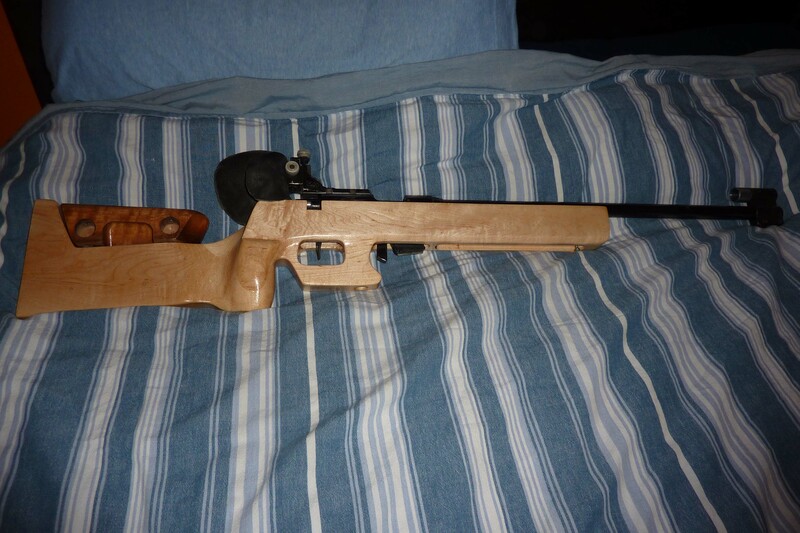 I’ve made rifle stocks in the past, but not in the last couple of years. Well orders have flooded in all of a sudden (when it rains it pours…). Here is the first of 7. 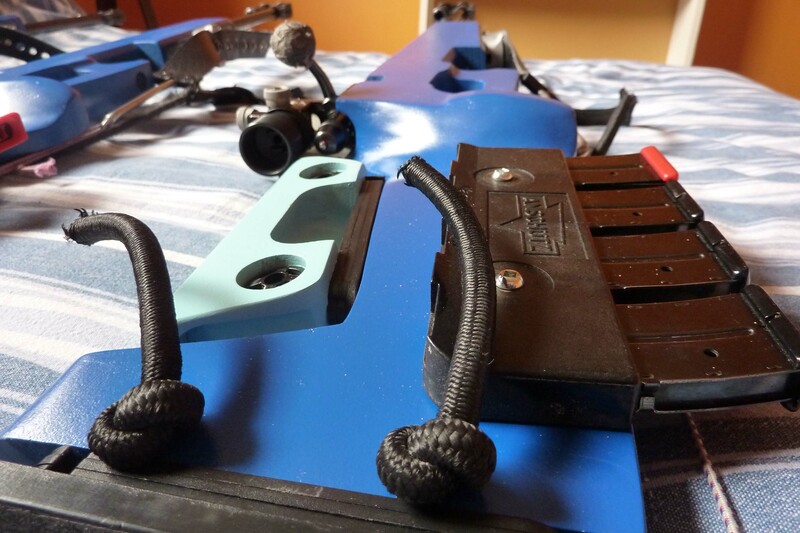 It’s a custom stock designed for a local athlete who came just shy of a medal at last year’s national championships. The design was mostly his suggestions, and they are loosely based on a German stock maker named Brislinger. 52 Create – my weekly creative output for 2011. Ahhh, commissions…. You love them cause you get paid, but you also don’t necessarily get to do what you really want to do. 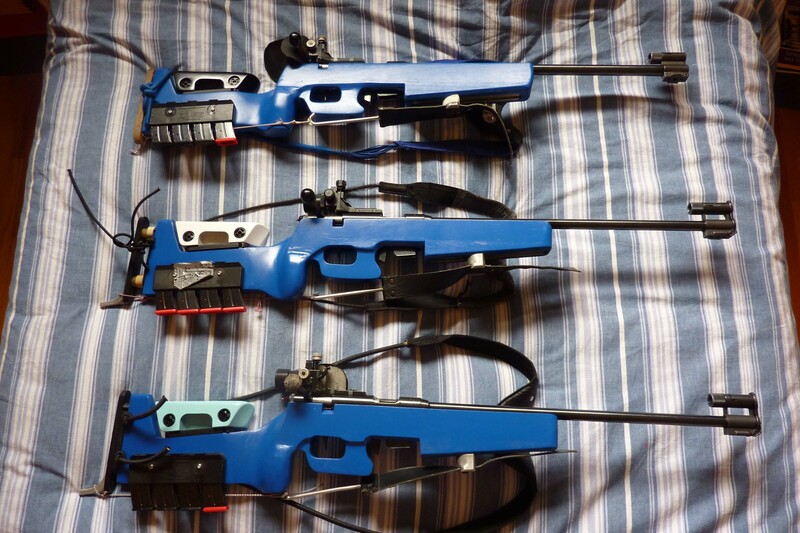 I’ve done a ton of rifle stocks (biathlon) this spring and summer, and the customers are happy with the results, but after a while you get a bit tired of the same old thing. This bunch of stocks was for a club that runs programs for youth. They had many old stocks that had dried out and cracked beyond repair (some were more glue than wood). 52 Create – my weekly creative output for 2011! Bamboo is certainly getting more and more popular in North America as a construction material, although it has so far been relegated to flooring and cutting boards. The other day while at my favourite local wood shop, I saw a few boards of bamboo. Boards you say? But I thought bamboo was grown in shoots? Well it’s engineered bamboo, they take thin strips of bamboo and laminate them into boards that are 7/8″x6″x8′. 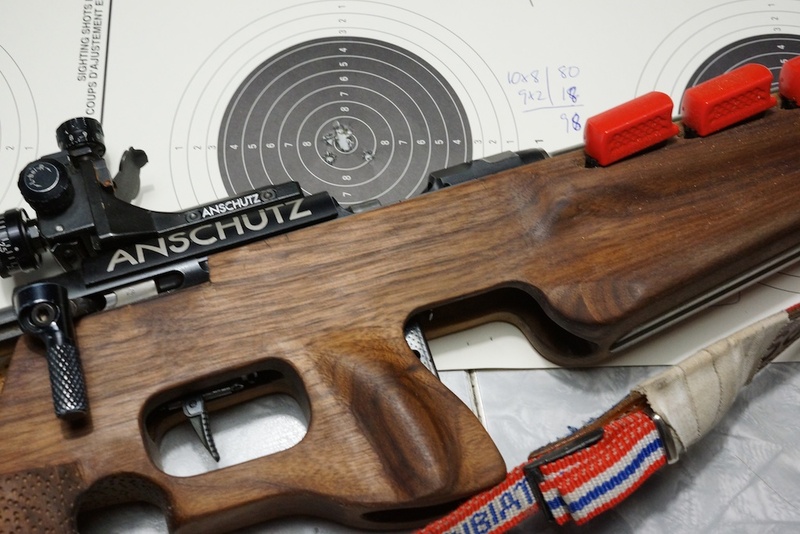 The perfect width for a biathlon rifle stock (well almost, needed a small amount of planing). After chatting with the staff, they admitted that it was a brand new product and they unfortunately knew little about it. 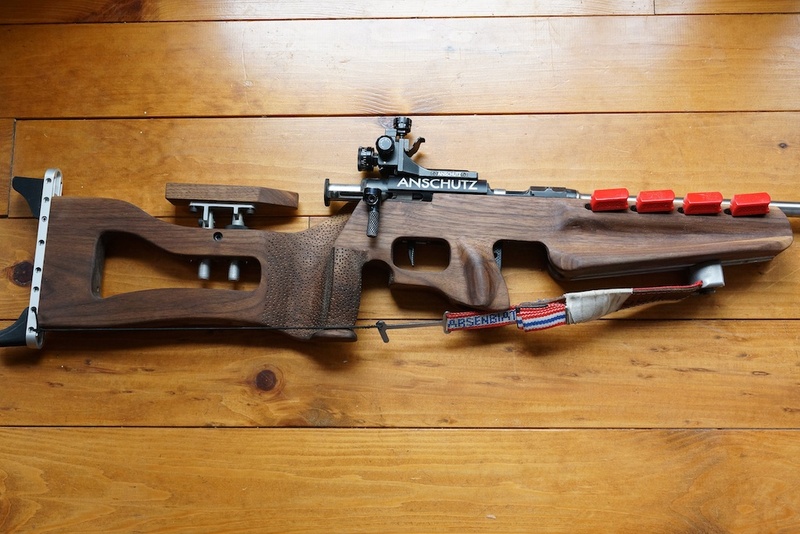 It was priced around the same as hard maple (which is what I would normally use for a rifle stock) so I went for it. 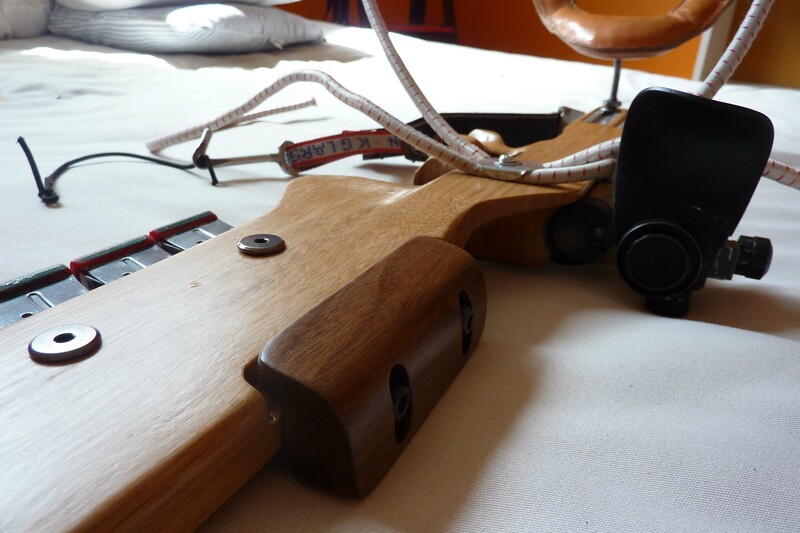 I got home and did some internet research on working with “carmalized bamboo”…… and found nothing. 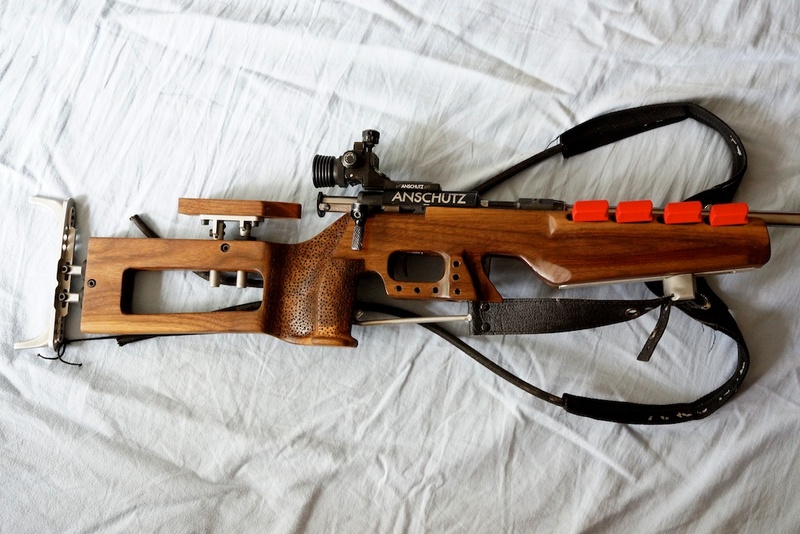 There are a few companies making bamboo rifle stocks, but the only info on working with bamboo was the odd woodworker who had some left over flooring that they had attempted to use to build some small furniture piece. 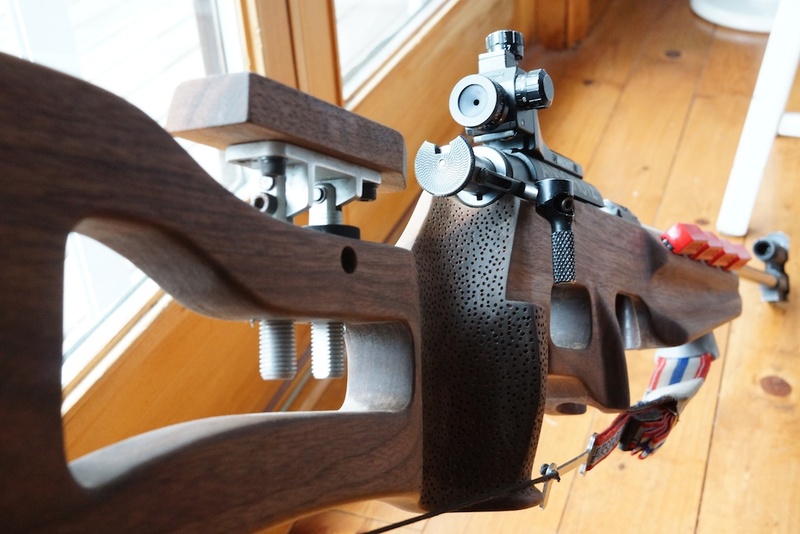 So I went into the project a bit blind, but I was fortunate that the athlete wanting the rifle was quite trusting and keen to go with my idea. This bamboo weighed about halfway between walnut and maple, but was as strong if not stronger than the bamboo, which means you could use much less of it in the stock (hence making it far lighter!). It’s fairly easy to work with as long as you’re using sharp tools, and oddly enough, it smells like shreddies when you sand/drill it out. My one caution to anyone working with bamboo is that it has a lot of splinters, and they are very sharp, and very fine (and very painful) so be careful when working with it. I used a few pieces of walnut as accent pieces, and finished it with some spar varnish (waterproof and UV resistant). 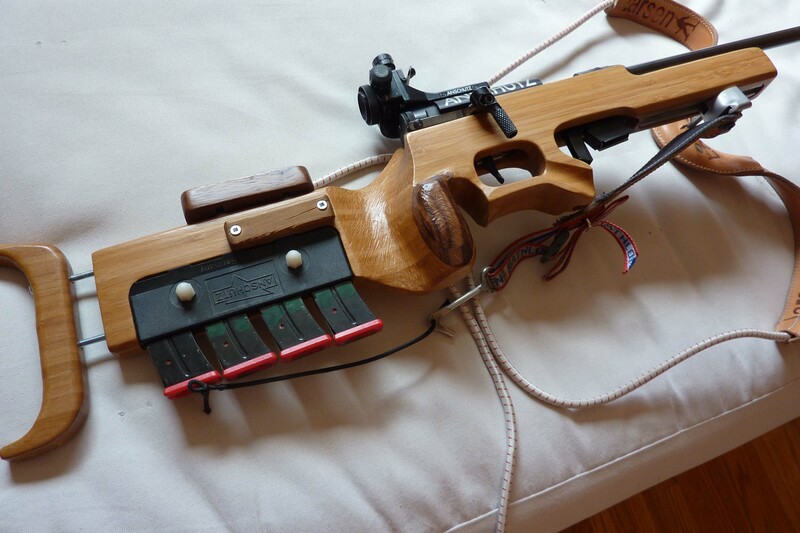 The greatest accomplishment is that the stock with all the attachments was 500 grams (1 lb.) lighter than her old version, a decrease of 30% which is huge when you consider this athlete has to carry this on her back over 15km!!! If anyone out there is looking at using this bamboo as a construction material feel free to contact me with questions, it’s great to use and I highly recommend it. 52 Create – my weekly creative output for 2011. It’s been ridiculously busy, which might be evident in my post being a day late, forgot it was Tuesday, honest. 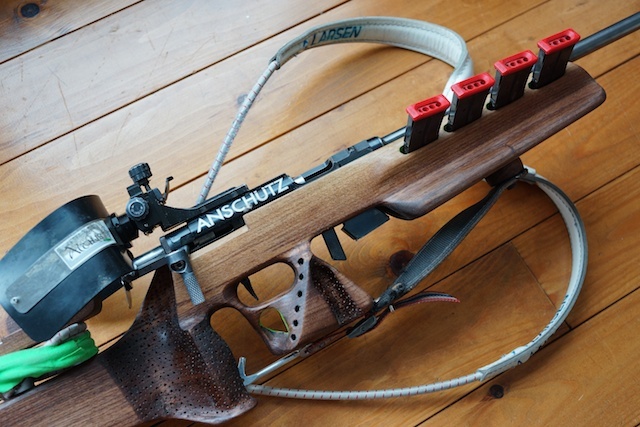 As I said before, I’ve got several orders for biathlon stocks due to my past career. The latest bunch are for my old team that wants sturdier stocks to replace the old cracked and broken ones they currently use. This design is a bit of a compromise between being the right size and shape, being simpler to make, and being indestructible.